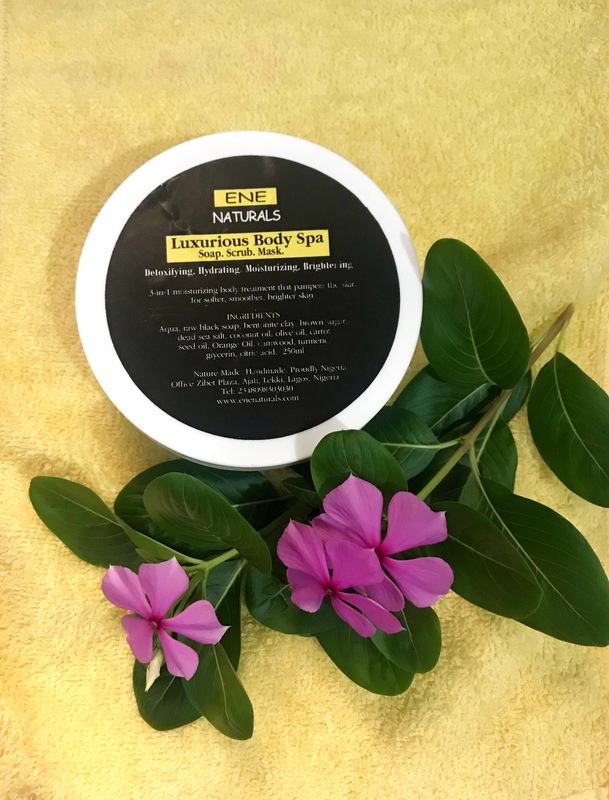 Ene Naturals Luxurious Body Spa is a soap, scrub and mask combo that exfoliates, hydrates, moisturizes and firms the skin. It is a rich blend of a wide variety of natural ingredients like African black soap, African bentonite clay, turmeric, African sandalwood, Dead Sea salt, brown sugar, frankincense, rose, coconut oil, orange oil, glycerin and a whole lots more. The Luxurious Body Spa makes caring for your body pretty simple and makes it even easier to experience real spa treatment at home at a fraction. You will see your complexion improve immediately. This can be used on the face or the entire body. It is only recommended to be used once a week or twice weekly. Say goodbye to dull complexion. 1. Moist your face or body with water. 3. Leave on your skin for 10 to 15 minutes. After 10mins, the Luxurious Body Spa dries and looks like a thin film. 4. As you scrub, you will see that the product lathers as well because of the African black soap in it. Rinse off with warm water. 5. After rinsing, gently towel dry. You will find your complexion improve almost immediately. Moisturize your face soon after. Please do not apply makeup after this treatment because your skin needs to breathe. This Luxurious Body Spa takes your quest for a brighter, clearer complexion even closer. With this weekly treatment and any of our fine moisturizers, you will be amazed at your skin. To order for this product and any of our products, pls visit our Shop on this website.